Here's my news from the last month. The book's Facebook page following tripled last month from 1,200 followers to almost 4,000. Learn more. The voice actor narrator for the audiobook version of the book was selected. Three of the authors he has recently voiced include Jeffrey D. Sachs (a renowned international economist), Reymondo Sanchez (the pen name of a former Latino gang member), and Tommy Mottola (a legendary music executive who helped launch Hall & Oates, Carly Simon and John Mellencamp; who was married to Mariah Carey; who has been mentioned by name in the lyrics of songs by Will Smith, Wyclef Jean, Lil Wayne, and 50 Cent; and who was mentioned in an episode of The Sopranos.) Learn more. Success Magazine announced it will do a review of The Camino Way in an upcoming issue. Success is a 120-year old magazine with a subscriber base of 500,000+. Learn more. To help recharge my Camino batteries, I spent two weeks of last month walking 190 miles (305 km) of the Camino de Santiago trail in Spain from France and Portugal. I posted pictures along the way on the book's Facebook page. See more. My first book, Lead Inside the Box, continues to generate buzz since it was named a Top 20 Leadership Book of 2016. The publisher of Lead Inside the Box now lists it as one of their Top 10 bestsellers, alongside books now in their 3rd to 15th edition of printing. Learn more. My latest interview about Lead Inside the Box appeared last month in the podcast, ManagerMojo.com. Learn more. 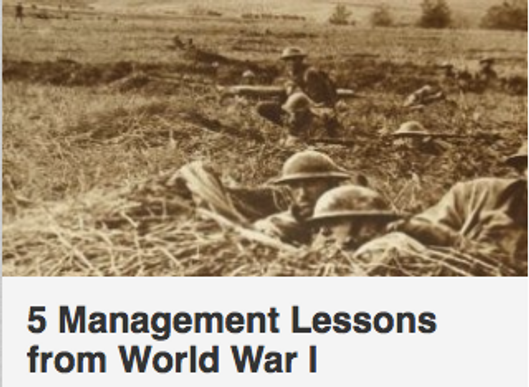 My April blog commemorated the 100th anniversary of the USA entry into World War I by highlighting the 5 essential management lessons from that war. Learn more. How to Take Better Pictures on iPhone - If you put your iPhone camera in video mode, you can take snapshots while videoing by hitting the little white button below the big video record button. That will make a frame a snapshot, which is wider and seems to be higher resolution too. You then just erase the video to save memory while keeping your snapshots. I learned this from some Canadians who were also walking the Camino with me this month.